1. Bring a small saucepan of water to the boil. Add the chicken and simmer for 5 minutes. Turn off the heat, cover and leave for 20 minutes. Meanwhile, cook the noodles for 1-2 minutes in simmering water, then drain. Mix the garlic, ginger, chilli, soy sauce, vinegar and brown sugar; set aside. 2. Lift the chicken from the water, remove and discard the skin, then slice. 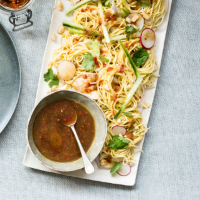 Serve the noodles topped with the chicken, cucumber, radishes, salad onion, coriander and peanuts, spooning over the dressing.